Using electricity to precisely stimulate the brain can boost people's working memory, a study suggests. The team at Boston University, in the US, gave people in their sixties and seventies the working memory of someone in their twenties. The effect lasted at least 50 minutes after the stimulation stopped. But larger studies are now needed to see if stimulation could help people in the "real world" or in treating brain diseases like Alzheimer's. Working memory is where your mind keeps temporary information, and has been described as the "sketch pad of the mind". You need your working memory to write down a phone number as someone reads it out to you. Problem-solving, mathematical calculations and decision-making all involve working memory too. Robert Reinhart, an assistant professor at Boston University, and one of the researchers, says: "It's essentially where consciousness lives." Working memory is different to long-term memory, which is how you recall your first day at school, wedding day, childhood pet etc. But working memory declines naturally with age. But can it be boosted? 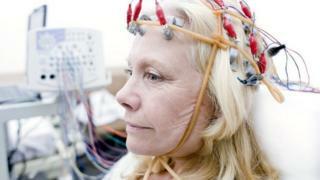 Image caption The research tried to coordinate people's brainwaves. The study, published in Nature Neuroscience, took 42 people in their twenties, and 42 in their sixties or seventies. They played a glorified game of spot-the-difference between two images shown one after the other. The young adults were faster and more accurate without any brain stimulation. But the older adults' performance improved with brain stimulation. Dr Reinhart said: "We can bring back the more superior working memory function that you had when you were much younger. "This is important because the global population is rapidly ageing, and the elderly struggle with many real-world activities that critically rely on their memories." These included "recognizing human faces, navigating the physical environment, remembering to take their medication and making financial decisions", he said. How does the stimulation work? The researchers were focused on brainwaves in two regions of the brain involved in working memory - the temporal and prefrontal brain regions. "The brain is like a conductor of an orchestra, and it's using low frequency rhythms [brainwaves] to communicate information," says Dr Reinhart. But the study showed that brainwaves become out of sync - like musicians giving a disjointed performance - as we age. The team at Boston University started by recording people's brainwaves with an electroencephalogram. They used electricity stimulation - specifically high definition transcranial alternating current - to strengthen and resynchronise the brainwaves. The researchers and other scientists want to see the experiments repeated with larger groups of people in order to be certain of the results. The other issue is whether the kind of boost reported in this study would make a meaningful difference in people's day-to-day lives. And it is uncertain how long any benefit lasts, as the study only tested people for up to 50 minutes. To be useful in real life would need either a long-term benefit or a way of making the technology portable. Do we dare discuss dementia? Image caption The researchers hope brain stimulation will eventually be used for a range of neurological disorders. The research was conducted only in healthy people, so it is impossible to draw conclusions about diseases like Alzheimer's. The researchers hope that one day brain stimulation will find a role in a range of brain disorders from dementia to autism and ADHD to epilepsy. The Alzheimer's Society welcomed the report: "Altering and correcting the circuitry of the brain with technology is a new exciting avenue of research for dementia." Can I cheat in exams? The technology has only been tested for restoring lost ability, but could the same approach be used for enhancement? Dr Reinhart says: "I think it is possible to sort of turbocharge even normal, healthy, cognitive functioning people, including young people. "But the largest improvements appear in the people with the greatest deficit at baseline... people who are struggling the most." Dorothy Bishop, a professor of developmental neuropsychology from the University of Oxford, says: "It would be premature to extrapolate the findings to everyday functioning in individuals with clinically significant memory problems. "There is no indication that any beneficial effects of stimulation persist beyond the experimental session. "Considerably more research would need to be done before concluding that this method had clinical application."